You can add files in several ways to a project. 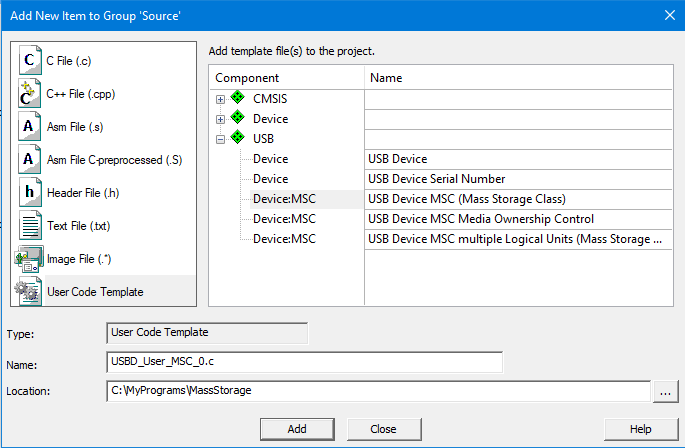 The most common way is to click on a file group in the window Project and use the context menu Add New Item to Group or Add Existing Files to Group. Using the menu or toolbar. Create a source file with the menu File - New. This opens an empty file in the editor window. Save the file (menu File - Save As) to make use of the syntax coloring feature. 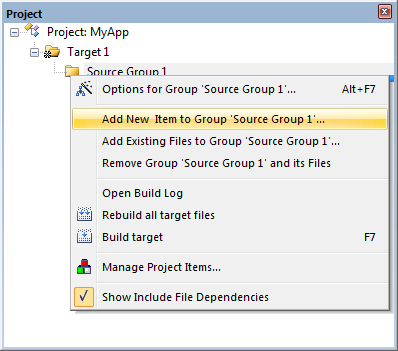 The option Add New Item to Group opens a dialog that allows you to add a new source file. When using Software Components, pre-configured user code templates can be added. C File (.c) - create an empty C source file. C++ File (.cpp) - create an empty C++ source file. Asm File (.s) - create an empty assembler source file. Header File (.h) - create an empty header file. Text File (.txt) - create an empty text file. Text files are not included into the target build process. Image File (. *) - add files and assert the file type Image file. This has implications when compiling a project. Refer to Using FCARM with µVision for details. User Code Template - create a source file containing function templates for the respective Software Component. Click on the Component to add the user code. Enter or change the file name. Shows the folder where the new item will be created. The option Add Existing Files to Group or Add Files to Group opens a standard file dialog that allows you to add one or more files. Select a File Group and click Add Files. This opens a standard file dialog that allows you to add one or more files. The option Use syntax coloring in the dialog Edit - Configuration - Editor. The definitions in the dialog Edit - Configuration - Colors & Fonts.